Your baby can hear before he's even entered the outside world. In fact, his hearing is almost fully developed by the time he's born. Babies use the sense of hearing to take in an enormous amount of information about the world. Find out how they use their keen ears to learn language and develop listening and other communication skills – and how the ability to hear stimulates baby development. Baby hearing starts to develop between 23 weeks and 27 weeks of pregnancy. To begin with, your baby will mostly hear your heartbeat, the rumbling of your stomach, and the sound of your voice as you go about your day. Babies are primed for bonding with their family by their ability to hear. In utero, they hear sounds in the outside world and start getting to know them. They already know and love their mother's voice when they're born, and are even familiar with the voices of other people in their family, such as siblings. It'll come naturally to you to put your face close to your baby's. Your baby will love it if you speak in a high-pitched voice and pause for him to take his turn. All of this helps his early understanding of speech. Soon your baby will hold your gaze, squirm, coo, and gurgle a conversation with you. Newborns actually sleep better in a noisy environment simply because it's what they're accustomed to. The womb is not the quiet place you might imagine. 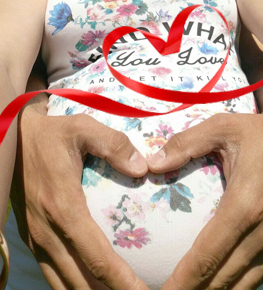 During pregnancy, the flow of Mom's blood makes a shushing sound louder than a vacuum cleaner. Cooing and repeating vowel sounds like ahh and ooh may be happening by about 2 months of age, and babbling is typically your baby's language by around 4 months. Babble back! It encourages her to try to talk more, and she'll love hearing to the sounds you're making. Babies can smell even before birth.. Your baby sees in color but can't see subtle changes of color..